Everyone loves a good spring clean, or at least the results of one. 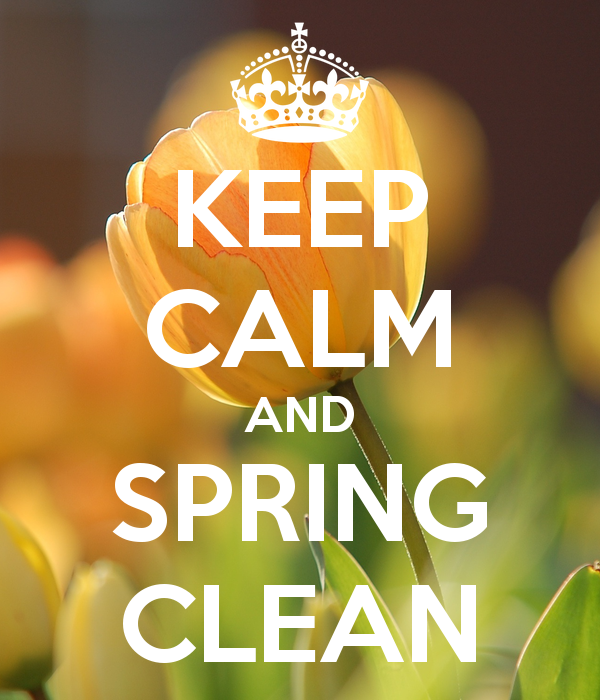 This spring we’re going to help you clean and declutter your home with a number of tips and tricks, as well as a spring cleaning checklist to make sure your home gets a real deep clean. One of the first steps in cleaning your home is decluttering. You’re going to be tidying and moving things around during your spring cleaning schedule anyway, so now is the best time to take a look through what you’ve got and figure out what you really need, and how to get rid of what you don’t. Clothes are a primary source of clutter in your bedroom, and can be a source of clutter in your home life overall. With a large wardrobe and chest of drawers it becomes easy to hang onto clothes you shouldn’t be hanging onto, and over time you build up clutter without even realising. Clothes that do fit you, but you never wear. Like clothes that no longer fit you, it’s time to make a decision, and that decision is almost certainly to let go. It might hurt, but it has to be done. Clothes that you can wear, and do, but aren’t in season. You can reduce the amount of space this takes up and store it somewhere out of the way. If it’s clean and folded neatly then there’s no harm in packing it away for half a year or so until it’s time to wear it again. Other common problems in bedrooms are bedside tables and chests of drawers getting cluttered with objects that get put down and never picked up again. It might be last month’s bedtime reading, laundry in a constant state of “needs putting away” or various sentimental objects that are yet to find a home. Now is the time to find that home for each and every one of them, once and for all. The bathroom gets dirty for a number of reasons, and not all of it is junk and clutter. When you look around, though, you’ll find that a surprising amount of it is, and now is your opportunity to sort it out. There are the bottles that are nearly-but-not-quite empty, which you need to finally get rid of, no matter how much it may feel like a waste. Chances are it’s used up, so there’s no sense hanging on. Then there are the beauty products you bought but never actually use. Like the clothes you never wear, it may feel like you should use it, since you’ve bought it, but if the practicalities are different, it may be time to bite the bullet and admit that they’re just taking up space. A thorough evaluation of these products is going to do most of the work of decluttering the bathroom, and then the rest is just cleaning up to get rid of old gunk. It’s way easier when there aren’t a million bottles to shift around the place. You might feel like your kitchen is going to be naturally kept in order, because a lot of it is either usable or in the way. When you get to look around, though, you may find that there’s more you can do here than you thought. Surprisingly, old food is probably the main thing cluttering up your kitchen. It’s not that you’ve necessarily got piles of food going mouldy in a corner (we hope), but that there’s a lot of food that doesn’t immediately seem like it needs clearing out and probably does. Check your fridge for condiments, spreads and sauces that you’ve opened and then left forgotten. Although they may keep for longer than the 3 days you’re advised, when you think about what was opened when you may realise that it’s been closer to 3 weeks or more. If it hasn’t been used, it’s time to get rid of it. Then there’s the unopened food, mostly tinned and dried goods that sit in the cupboard waiting to be cooked but never quite make it. Everyone has a tin of something that they’ve had for a few years and still hasn’t reached its best before. You probably have more than one. Empty your cupboards, think about everything that’s been in there for longer than a few shopping trips, and consider whether you really should be holding on to it. Use it in your next round of meals, or donate it to a foodbank where it’ll get used rather than gathering dust. It’s not just food that’s cluttering up your kitchen. Old pots, pans and utensils end up sitting around, gathering dust and going unused thanks to their age. Pots and pans frequently break and become awkward, but never get thrown out. Utensils are replaced with newer versions but still hang around for some reason. Crockery and mugs get broken, and then sit on the windowsill waiting to be repaired or properly disposed of. Take inventory of what you use and need, then get rid of the rest. This is probably the room that feels most cluttered to you. That makes sense. It’s the room where you live, so not only is it most likely to gather clutter, you’re most likely to notice it there. What’s actually taking up space and making you feel crowded? As nice as they are, it is possible to go overboard on blankets, cushions and throws. That doesn’t mean you have to get rid of the extra, though, just think about packing them away somewhere out of the way for a little while. The hidden second benefit to this is that when you feel like your living room needs a refresh, it’s easy to break out the spare cushions and throws and pack up the current lot for a 5 minute makeover. Think about what’s taking up space on your coffee table. A few magazines might offer an extra lived in feel, but this room is already lived in plenty, and your coffee table collects enough real clutter that you don’t need decorative clutter too. A single vase of flowers, if that, and a placemat is probably enough, and then you can make sure to keep the coffee table looked after during your ordinary tidying activities. Like the bedroom, the living room is often a catalyst for items that are looking for a permanent home, but are just put to the side until one is found. If you really want a tidy home, now is the time to find somewhere for those items to go. It might be the workshop, the home of constant works-in-progress, or it might just be storage space, but that doesn’t mean it has to be an absolute mess. In many cases, sheds and garages end up collecting way more rubbish than they have any right to, simply because it’s expected that they’ll be messy. But there’s a big difference between a productive mess and a dumping ground for junk. If you’ve been using your shed or garage for DIY or side projects, then you’ve probably got a lot of offcuts and discarded, broken items that have simply been left to the side. Collect them all up and throw them out, now. A sweep or hoover on occasion is also a good way to keep the mess from becoming unmanageable, so even if it’s just going to get messy again straight away, better to keep on top of it than let it get out of hand. Now is the real time to test your powers of decluttering, as you’re probably going to find plenty of things that have been put into storage waiting for their time to shine. You need to make some tough decisions on all the stuff you’re keeping hold of for no reason other than to have it. You might want to set aside an entire day to do this so that you don’t get distracted half way through and forget about it. Leaving it until later is generally the sort of behaviour that allows clutter like this to build up in the first place. Once you know what you’re getting rid of, you also need to figure out how. Though your mental image might be of sweeping through the house with a bin bag and tossing it all out with the rest of your rubbish, chances are that a majority of what you’re getting rid of can still find its way to a good home with someone else. If you have enough to get rid of, and you think it’s worth something, then consider taking it to a car boot sale. Spring is one of the best times to find one, since everyone’s going through this same process. If you don’t have enough to get rid of by yourself, get a few people together and take it all down in the same car. A lot of the rest of what you’re getting rid of can be given away to charity, either collected on the kerb or taken directly to a charity shop or homeless shelter yourself. Not only are you cleaning up your own home, you’re also helping people who really need it. Finally, you might not be ready to fully get rid of something just yet, but that doesn’t mean it has to take up space. Find some storage options and pack it away in an attic, garage or shed. When next year’s spring cleaning rolls around you can take another look at it. You’ll have a much better idea of how much you really want it after a year without. Decluttering may be a task you want to do by itself, but it’s often something that you’re keeping in mind while performing a more thorough deep clean of your home. Deep cleaning involves all the tasks that don’t need to be done as part of a regular cleaning schedule, but certainly need to be approached at least once or twice a year. A lot of grime builds up over winter, so spring is a great time to get into all the nooks and crannies of your home and get to clean them out properly. Approach your deep cleaning on a room-by-room basis, and don’t worry about getting it all done in a day or two. It’s going to take a month’s worth of weekends before it’s all completely done, but once it is it’ll last you many more months to come. The first thing to do is to open your windows and let the fresh air in. More importantly, you’re letting the dirty, stuffy air out. Windows don’t get opened often during winter, for obvious reasons, and so a lot of the air in your home has been getting stuffy, carrying a lot of dirt and debris. Opening the windows lets you get the fresh air in, and helps all that dirt and dust escape into the world. Don’t worry if it’s a little chilly. Once you get to work you’ll find yourself warming up in no time. The first step in almost every room is to move furniture to the centre of the room. This will not only give you easy access to the walls and skirting boards around the edge, but also at the floors underneath the furniture that don’t always see the full benefits of your regular cleaning sessions. While you’re moving furniture, you’ll also be moving everything that’s on that furniture, whether it’s ornaments, covers or the natural, daily build-up of items. Now is the time to figure out what you’re throwing away, what you’re keeping, and where it all goes. This is one of those tasks that takes a lot of work, and doesn’t make much difference on a week-to-week basis. After a few months of build-up, though, you’ll definitely notice a change after the clean. Use cleaning products that are appropriate for your walls, especially taking into account whether they’re painted or wallpapered. Before going all out, test whichever product your using on an inconspicuous spot. If there are no ill effects, carry on, and if there are then at least it’s hidden. Follow up by dusting the skirting boards and giving them a quick wipe down to make sure they’re also clean. Make sure not to leave your walls damp, since that can lead to a build-up of mould and peeling paint or wallpaper. If the cloth was too damp then wipe the excess away with a clean towel or rag to help the water evaporate away rather than seep in. Door knobs, dresser handles, light switches, taps, all the small things that don’t see a lot of attention but do see a lot of use. Likelihood is that most of these are given a quick wipe down during your regular cleaning sessions, but today you want to give everything a good dust, scrub and polish to make sure it’s gleaming. Just give all the small things a little extra attention, and it’ll make a big difference. Light fittings and lampshades might not receive the same regular attention, but definitely benefit from a dusting. You don’t need to mess around with damp cloths and cleaning products here, just a quick wipe down will deal with most of the grime and get everything shining again. While you’re here, you should also take the opportunity to dust in all the difficult to reach places: the tops of tall furniture, underneath drawers and long handles, around the legs of furniture and at the backs and sides. These are places that probably don’t see much cleaning, so make sure to give them attention now. Windows definitely need a good clean inside and out, and it needs to be done properly or you risk making them worse than when you began. Just using water and a cloth will spread the dirt around and leave streaks on the glass, which is no good. To get a window looking really good, you need the right tools. First you’ll want to dust the window to get rid of the surface dirt. Otherwise, getting it wet will just add to the amount of muck that needs cleaning. After it’s dusted, you can start applying the cleaning solution. You can opt for a specialist-cleaning product if you want, as long as you make sure it won’t damage the surrounding paintwork. An easier option is to use simple washing up liquid, and an even safer and greener option is just to use a little white vinegar in a bucket of warm water. On your first pass, don’t be afraid to use plenty of water to really wash all the dirt off the window. Using a large sponge is your best option, to keep the window safe from scratches and properly clean all the dirt away. Once it’s looking clean, take a squeegee and wipe the excess water away in slow, clean, downward strokes. If you leave any water on the window, the drops will leave watermarks that make the window look mucky, so make sure that you finish the job properly. Once the rest of the room is finished, it’s time to hoover around before you put the furniture back. Hoover once before you move the furniture, and then again afterwards, not only to make sure you get every part of the floor but also to make sure that any residual dirt from moving the furniture doesn’t go left uncleaned. The above advice applies to most rooms in your home, but there are a few extra things to pay attention to as well. In particular, you’ll have a couple of extra tasks to take care of in the bathroom and kitchen, as well as some porch, conservatory or patio work if you have them. In your bathroom you’ll need to consider if it’s time to re-grout. If your grout has become discoloured then it’s not necessary but you may want to do so just to make the bathroom look good. If you’re starting to see mould, or the grout is falling away, then it’s definitely time to re-do it before the problem becomes unsolvable. In the kitchen you’ll need to look at cleaning the oven and microwave, if any. Even if you clean your hobs regularly, now is the time to give them a deep clean as well. In all these cases, you’ll probably want to use stronger or more effective cleaning solutions to really reduce the grime and get your kitchen back to operating at peak efficiency. In any room with bookshelves or CDs and DVDs, you’ll need to remove items and give them a quick dust individually, as well as dusting the shelves underneath them. It does make an immediate visual difference, but it’s also good to stop the build-up from becoming too bad over long periods of time. Finally, it’s time to look at your garden. Patios and decks will have built up a lot of dirt over the colder, wetter months, and it’s time to clean all that up. At the very least, you can give them a hose down or wash to get rid of soil and earth, followed by a good scrub to stop moss from growing. Specialist tools like a deck scrubber will help you get in all the nooks and crannies to make sure it’s properly cleaned out and sparkling when you’re finished. Spring isn’t just a good time for cleaning; it’s also a good time for redecorating. You don’t have to completely renovate a room in order to refresh it; sometimes you can try out a new look with a very small amount of effort. While decluttering, consider putting some of your extra ornaments or furniture coverings into long-term storage. This will help you with decluttering and give your room a slightly new look, but more importantly it then becomes easy to completely redecorate in future by swapping your stored decorations with your active ones. If you don’t have any extra decoration on hand, buying a few new items and storing your current set is another quick way of changing the look and feel of a room. You can also refresh a room without adding anything or even taking anything away. While you’re tidying, you’re going to be moving furniture around. Consider putting it all back in a different place. You’d be amazed how much a room can change by just rotating a layout a little, or switching where smaller sideboards and coffee tables go. A slightly more extreme option is to re-paper or paint a room. Even then, this doesn’t take too much extra effort, and if you need to move furniture around a room to clean it anyway, you may as well add a fresh lick of paint to the walls while you’re doing so. You’ll be cleaning up afterwards either way. You don’t even need to paint an entire room to change the look. Sometimes just changing one wall or part of a few walls works, or even painting wood furniture if you’re comfortable with experimenting. Spring-cleaning is the perfect time to experiment with new layouts and new looks, and completely refresh the feel of a room or even your entire home. Don’t be afraid to experiment if your home is starting to feel old, but also don’t be afraid to leave it the same if you’re happy with it. It’s your home, and you should feel comfortable in it, no matter what. Spring cleaning is a monumental task, and it’s fine to feel a little overwhelmed when you’re about to start. The trick is to take stock and properly plan it out, as well as to make sure you’re not trying to do too much. Take it one step at a time, and don’t feel the need to overwork yourself to get your home clean. The best tip for organising your spring-cleaning is to only focus on one room at a time, and make sure that room is absolutely, completely finished before moving on to the next. In some cases, you may have to return to a room if, for example, cleaning one room turns up something that belongs in a room you’ve already cleaned. That’s ok, because when you’re tidying like that you should be making sure that everything gets put away in its proper place. When moving things between rooms, just make sure it gets handled properly and immediately at the other end. There are plenty out there, or you can create your own, but either way a checklist helps you keep track of what has been done and what still needs doing in each room, so you don’t lose track. Make sure you think about what each room will need before you start, so you don’t get half way through and realise you can’t complete it. Finally, it will also make you feel better each time you can check something off the list, so you have visible proof that you’re making progress. If you’re enlisting the help of family or good-natured friends, make sure everyone knows what they’re doing. If everyone starts on a room all at once, it’s inevitable that people will get confused. Some tasks will be done twice, some won’t be done on time, and some people might end up doing an unfair amount. If others are getting involved, make sure everyone has a well-defined role and sticks to it, to get everything done properly and to avoid arguments. You won’t get it all done in a weekend, and you don’t need to. Once a room has been properly cleaned, the benefits will last for a significant amount of time, maybe even until next Spring. Don’t worry too much about getting it done quickly, because if you take your time and do it properly you’ll be feeling the effects for a long time to come. Dust before cleaning: Whenever you’re about to clean a surface, make sure it’s fully dusted first. Use a dust cloth or hoover to clean way any loose, dry dirt, otherwise wetting it will smear it across whatever surface you’re cleaning, and make your job more difficult. Use a Squeegee for glass surfaces: Glass surfaces are easy to stain with watermarks, most often when water isn’t properly cleared away after cleaning. Use a squeegee to help clear away excess water and leave your windows and mirrors sparkling. Test before using: Before using a cleaning product on a particular surface, always apply a small amount to a small, hidden area to test the effects. If it discolours, stains or otherwise damages the surface then at least the damage is hidden, and you won’t have accidentally used it on the entire surface. Start from the top: When dusting and cleaning, start from the top of the room and work your way down. Disturbed dust will float down and settle further down furniture and on the floor. You’ll be gradually moving it further down until you can hoover it all away at the bottom. Treat your wooden furniture: Remember that you should be taking care of your wood furniture. If it’s starting to look a little dry, worn or damaged, then make sure you treat it properly. We have guides on how to take care of wooden furniture. Try green cleaning methods: One of the concerns with spring-cleaning is the large amount of cleaning products that get used, especially potentially harmful and environmentally dangerous chemicals. Almost all of them have friendlier, green replacements. Most things can be cleaned just using vinegar or baking soda. Eliminate odours with cooking: Air freshness doesn’t have to come from a can. Your kitchen can also be a source of air freshness, by boiling cinnamon, cloves and other spices. Alternatively, make a fresh batch of cookies and get double the benefits with a tasty treat. Clean out computers: While cleaning out an office or games room, you might also want to take a look at your PC. While it can be dangerous to mess with the PC’s innards, a simple can of compressed air can clean out the dust and make your computer work significantly better thanks to a ‘dusting’. Just make sure not to use any actual cleaning products, dusters or hoovers inside the computer. Defrost the freezer: Defrosting the freezer provides a perfect excuse to declutter it. Since so many items end up sitting there for long periods, defrosting will force you to either use them or throw them away, as long as you know you won’t actually miss any of it. Food shouldn’t sit in the freezer for too long anyway. Don’t overwork yourself: Spring-cleaning is supposed to make you feel better about your home and your life, but there’s no need to go through hell to get there. Take it easy and make sure you don’t work yourself miserable in pursuit of happiness.